The booking page is your customer-facing, web-based appointment calendar. Your customers will use it to book appointments with you. It's an extension of your business' image and brand. Time increments - You can set up the increments for appointment times in increments of 15 minutes to 4 hours. Minimum lead time - This is how many hours you want in advance to prepare for an appointment. The minimum lead time prevents customers from making an appointment outside of the lead time window. For example, are you able to respond to same day appointments? If not, you should give at least a 24-hour minimum lead time. Maximum lead time - How far in advance of the appointment day will you let customers make appointments? The default is 365 days. Notify the business via email when a booking is created or changed - When this setting is ticked, the staff member for the appointment and the Bookings calendar owner will receive an email letting them know about the appointment. Allow customers to choose a specific person for the booking - This will let customers see your staff members and lets them select which staff member they'd like to have the appointment with. This is where you'll set your color theme, and logo. Select the color combination that most closely matches your brand. If none of these options match your brand, we suggest using the neutral blues and grays or keep the default, which is a neutral blue/gray combination. You can choose to display your business logo on your booking page. This is the logo that you've uploaded and is displayed above the menu on the left. 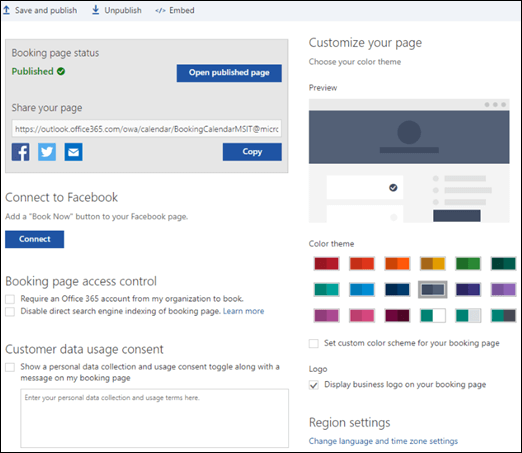 Select whether users will need to authenticate with their Office 365 work or school account before they are able to access and use a booking page. This is useful for intra-organization only bookings scenarios. You’ll be able to control whether your Bookings page can be indexed by search engines. By default, your Bookings page will be indexed, but, you can now hide Booking pages from search engines. You might want to do this if you don’t want your Bookings page to show up in a Bing or Google search. This may not always work, if other pages provide links to your Bookings pages, those links will get indexed. Select whether users see a message, and choose whether you can collect their data. You can also add questions to ask your customers at booking time. For more information, see Add custom and required questions to the Booking page.